I’ve got to be honest: I recently did a workout that involved multiple rounds of toes-to-bar followed by deadlifts. Safe to say, my hands started to hate me. My grip became as weak and as unreal as a newborn unicorn. Grip is an important factor when it comes to working out to the best of our abilities. From pull-up bar exercises to barbell lifts, if your hands aren’t in pique condition, you could be asking for trouble. That’s why gloves are so damn important. In this article, I’ll be going over how and why to train with calisthenics gloves, what types of gloves there are for workouts, what to look for when browsing for your gloves and review the top gloves on the market right now. Read on to learn everything you need to know about calisthenics gloves and how they’ll upgrade your workouts. This is a widely debated topic in the fitness world. In one camp, wearing gloves keeps you from developing grip strength; in the other camp, wearing gloves keeps your hands safe from ripping open calluses, preventing you from even working out. The verdict is quite mixed. I’d suggest trying both out and going with the option that feels best to you and your performance. For some people, going au naturale and grating their hands up is most optimal. Others want that padded comfort for the highest quality workout. The choice is ultimately up to you. Grip: While it might reduce your actual hand strength, it is tremendously beneficial for those workouts where your intensity is off the charts. Sometimes you sweat or your hands get tired or sore from gripping bars. Suddenly, you can’t perform reps because you can no longer grip. With gloves, you don’t have that problem. The only failure is muscular and central nervous system, not your hand grip. Comfort: It doesn’t all have to be pain and suffering. Wearing gloves should, for the most part, save you from uncomfortable calluses and other abrasions. 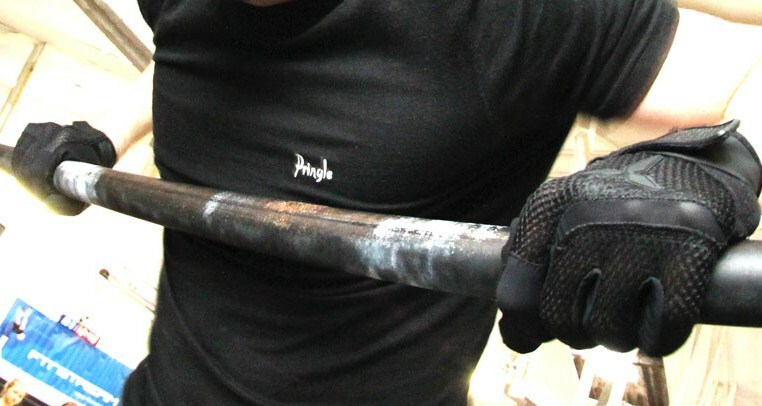 If you value avoiding those crosshatched barbell “handholds,” gloves are great for preserving your hands. Wrist Support: Sometimes, it’s your wrists that give out first. Easily fatigued, your wrists need some form of protection. Even people who don’t use gloves but lift heavy still have wraps to aid in both grip and wrist support. Injury Protection: With hands and wrists padded, you can steer clear of nagging injuries or calluses that rip open over and over. Your hands are important pieces of your workout puzzle; keep them as fresh as possible! Obviously, the singular trait that separate the two is the inclusion or removal of fingertips. For a matter of preference, this again depends on your personal views and performance. Whether gloves with or without fingertips are better at helping you with grip, comfort, and safety is up to you. Both versions are included in our review list, so scroll down to the links to see which type of glove fits your fitness goals best. You should be looking for a few qualities in your calisthenics gloves. Here, I’ll explain what those are and what you want in a workout glove specifically. Quality gloves are durable and comfortable simultaneously. For this reason, you’re looking for calisthenics gloves made from neoprene, nylon, and leather. And of course, on the palm you need material that aids in grip. The gloves should also be thick or padded; they need to be able to withstand constant stress during workouts, as well as providing comfort and injury protection. The gloves have to be malleable to contour to your grip and movement. While the material should be sturdy and durable, you need an element of flexibility to the joints and back of the gloves. This adds to comfort to your workouts. Now, you have to make a choice here. Either you go with a rigid glove that eventually matches your specific grip, which adds to the protection of the glove, or you go with a glove that includes breathable materials, such as mesh or nylon, which gives you the least amount of cushion but the most freedom of motion. This is a personal decision, one that should be tested in the gym. For calisthenics gloves, wrist support is crucial. You need a pair of gloves that come with adequate wrist straps, to keep your forearms and hands sturdy when on the pull-up bar or deadlifting heavy amounts. They must be able to velcro or wrap securely and snuggly, but not too tight (you want to maintain circulation in your extremities). If it comes down to two specific gloves, and one offers better wrist support, buy those ones. The importance of wrist straps cannot be stressed enough. The first pair of gloves on our list is minimalism at its finest. The WODies by JerkFit gives you full palm protection and massive wrist support for your heavy lifts. These babies are the most un-glove gloves out there; they stop at the palm, keeping the fingers vulnerable to calluses and grip issues. American-made, with free shipping within the U.S.
For a simple, palm-and-wrist protector, give WODies by JerkFit a try! Covering a little more of the hand, Fit Active Sports’ New Ventilated Weight Lifting Gloves give an added level of protection. These half-gloves provide ultimate support, impressive wrist straps, and help with grip. To upgrade your daily workouts while keeping your hands safe and comfortable, Fit Active Sports is the way to go! Trideer Workout’s gym gloves are the first gloves on this list to cover the entire hand. While still without fingers, these gloves provide full palm protection, lower finger protection, and extra grip. They give you impeccable durability at an affordable price. Mostly made of lightweight microfiber and breathable mesh for a comfortable, dry workout. Tabs on the fingers to make pulling them off a breeze. If you enjoy a full-glove feel and maximum comfort, Trideer Workout Gloves are a must-have! As we continue to cover more of the hand through this list, Fenglei’s workout gloves stand out for multiple reasons. Made of a lightweight microfiber and anti-slip silica gel for the palms, these gloves stick and grip where you need it the most. Foam padding over the palms provide the ultimate cushion, while the silica gel keeps you on the bar. You want comfort, breathability, flexibility, and no sweat? Fenglei workout gloves are here for you. The only full-fledged glove on our list, Bionic pulls no punches with their mainstay fitness gloves. These bad boys give you a lot for workout gloves, including a patented relief-pad system that evens out the palm, providing a maximum grip potential. Neoprene wrist wraps and additional cushion in the thumb area allows you to workout the way you want to. Not to mention, they have special material in the thumb and forefinger, so you can interact with your phone for music or fitness app purposes. For a glove that gets you and throws in all of the bells and whistles, Bionic Gloves are where its at. If you want to maintain those beautiful hands, wearing calisthenics gloves may be of assistance. They help with grip, keep your hands comfortable while slinging around heavy weights, and keep you callus-free. While they come in different forms – fingers or no fingers – they still provide unbelievable benefits. So long as you ensure the material, flexibility, and wrist straps are of the ultimate quality, you’re on your way to an awesome workout experience! Check out and research the gloves on our list and choose the ones that are right for you. Next time you enter the gym, the weights won’t tear you up – you’ll be the one tearing it up!